Dave Pierce is both one of the first and one of the friendliest residents of Chester I met when I started working at CTC this past April. A cultural preservationist, Dave is president of both the Chester Foundation, which operates the historic Chester Railway Museum, and the Friends of the Keystone Arches. I have asked Dave, as well as other Chester residents, to contribute stories they have about Chester and its history to the blog as part of a periodic series called CHESTER CONVERSATIONS. For more information about the Chester Railway Station or the Keystone Arches, click here or check out the end for further information. Much of what we understand of our history remains vague. This country was built by immigrants. How? Where did it begin? The canal age came to an end and railroads took over. When? What was the impetus? The horseless carriage and highways replaced the wagon and their rutted roads. Where was the historic fulcrum? These seemingly unrelated events are assumed by most to be lost behind the veils of time. However, we can not only explain how they occurred, but more surprisingly, where. These events all took place right here in the backyard of the Chester Theatre Company and the Chester Railway Museum. The Irish population of Boston had tripled between 1830 and 1840. Migrating prior to the potato famine of 1850, these people had left home to escape religious persecution. 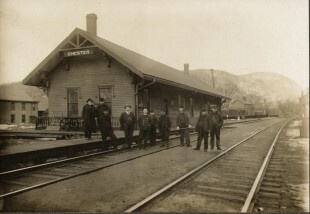 When construction of the Western Railroad from Worcester to Albany was begun in 1835, the logical place for these displaced Irish to seek employment was in Western Massachusetts. During the peak of the project (1838 – 1841) these men, women and children joined the ranks of the railroad pioneers who built the world’s first mountain railroad over the Berkshire Range – the very railroad which runs through Chester. In our area, these workers lived largely in three shanty towns – one in Chester and two in Middlefield. Currently, archaeologists have found the site of only one of the Middlefield settlements. The 1840 census revealed the worker’s presence as a large uptick in the hilltown population. They weren’t counted by name, only numbers and references such as ‘65 year old woman’. It is estimated that up to 3,000 immigrants worked to complete the railroad. Working without dynamite (which wasn’t invented until 1863), the cut at the Washington summit alone kept 1,000 busy with picks and shovels creating the 3/4 mile long opening that reached 65 ft. at its greatest depth. Despite being the highest (1459 ft.) and longest (150 mi.) railroad in the world at that point in time, the world’s first mountain railroad took only 2.5 years to complete. We are no longer an America that could do this, even with all our technology. Today, the promoters would be in court for 20 years before the first shovelful of earth was moved – if ever. 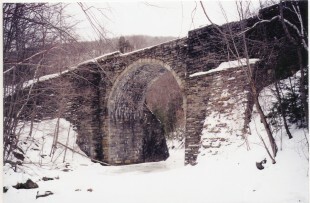 Contrasting with the area’s Irish majority, the Scottish-born owners of the subcontractors “Birnie Bros Construction” built 27 bridges, culverts and walls in the mountain section – including the first cluster of stone arch railroad bridges in America – right outside of Chester. Known as the Keystone Arches, they represent one of the most inspiring archeological sites anywhere. Enough stone was cut and transported to build a wall 6 ft. high and 40 miles long! 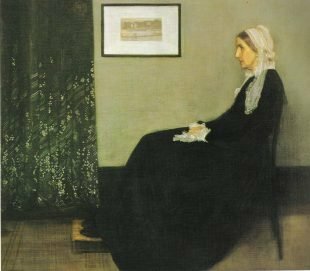 Two decades prior to the Civil War, while executing his railroad commission in Russia, Whistler would die in a cholera epidemic, robbing America of one of its most successful and innovative civil engineers. His talents could have been employed commanding the Union Railroads during the Civil War, and later helping to build the Transcontinental Railroad, making him much better known to us than he is today. 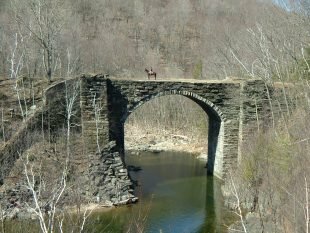 In addition to being the home of the first mountain rail line, the hill towns of Huntington, Chester and Becket are home to the world’s first mountain highway crossing built specifically for the automobile. Known as Jacob’s Ladder Trail, or U.S. 20, it crosses the Berkshire Range in the town of Becket at the patriotic altitude of 1,776 ft. In this case, the sponsor is the much better known George Westinghouse, inventor of the railroad air brake (among other things), and early aficionado of the horseless carriage. Westinghouse helped to fund the taming of the rutted wagon path, a portion of the Boston Post Road. Grades were reduced from around 14% to a maximum of 7% – more manageable for the fledgling automobile. Many patrons of the Chester Theatre Company travel Rte. 20 from either Exit 2 in Lee or Exit 3 in Westfield on the Mass Turnpike to Chester, most never knowing the historic nature of this byway, which celebrated its centennial in 2011. Visitors to this bucolic community of Chester never dream of the precedent-setting revolutions in the field of transportation that occurred here, or that our ‘nation of immigrants’ was born in our area. If you are interested in learning more about these and other historic events, stop by for a visit to the Chester Railway Museum this summer. We are just a short walk around the corner from the theatre. The Chester Foundation works to preserve the unique history and culture of Chester, holding the annual Chester On Track Festival and functioning as the visitor’s center for the Keystone Arches Bridges Trail. The Chester Railway Station is open by appointment only. For more information or to schedule an appointment to see the Railway Station, call 413.354.7878 or contact Dave Pierce through the Chester Foundation website at chesterrailwaystation.net.